• Short-term changes in sea level. • A wave is energy moving through water. Waves are generated by a disturbing force - something that transmits energy into a fluid medium (such as wind blowing on water). A pebble hitting a puddle generates a splash that creates ripples (tiny waves) that propagate away from the source (Figure 10-2). The ripples grow smaller as they move away from the splash (source) until they diffuse away with increasing distance, or when it encounters the edge of the puddle. Fig. 10-1. A wave crashing onshore releases energy. 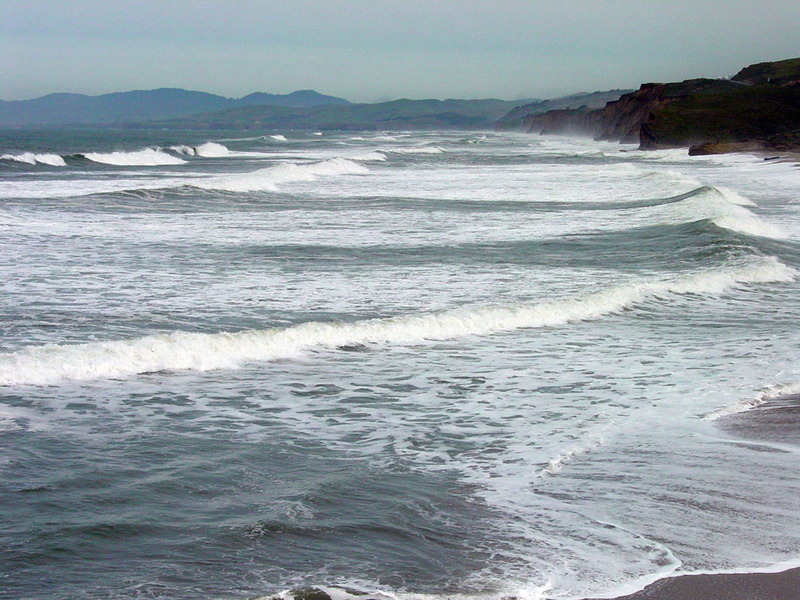 Wind is the disturbing force for waves in the ocean and large bodies of water. Waves are also generated by earthquakes, landslides, and volcanic eruptions (producing tsunamis), and tides are produced by gravitational interactions between the Earth, Moon and Sun. Fig. 10-2. A splash is an example of a disturbing force creating waves. Ocean waves are created by wind blowing over water. The distance between two wave crests or two wave troughs is called the wavelength. Wave height is the vertical distance between the highest (crest) and lowest (trough) parts of a wave. (Figure 10-3). Wave period is the time interval between passing wave crests (completing one cycle) and are measured as wave crests pass a stationary point (such as waves passing a buoy or pole on a pier)(Figure 10-4). Fig. 10-3. Wavelength and wave height of wave cycles. Fig. 10-4. 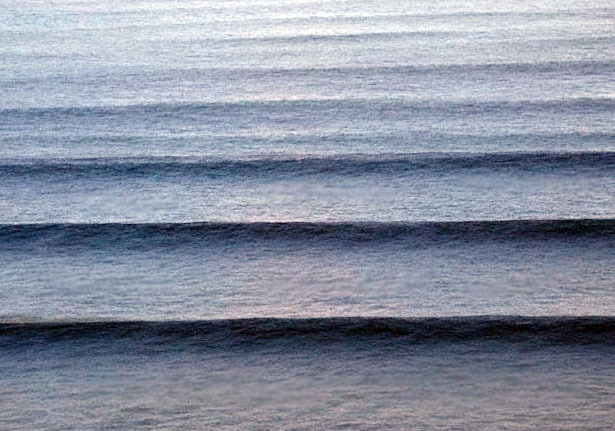 Waves approaching a shoreline arrive at cyclic intervals called a period. Wave speed is a function of wavelength and wave period, and is related to the wind velocity where the waves form. Wave speed (c) is the distance the wave travels divided by the time it takes to travel that distance. Wave speed is determined by dividing the wavelength (L) by the wave period (T). [c = L/T]. Wave period is the average of how many seconds pass between a series of wave crests moving past a stationary object in the water, such as a post on a pier or a buoy. What is important is the combination of the wave height and wave period. Wave period is directly related to the speed the wave is traveling. The longer the period, the faster the wave, and the more energy in contains. The greater the period the faster the wave moves (Figure 10-5). Also, the greater the period, typically the higher the wave breaks as it approaches the shore. Fig. 10-5. 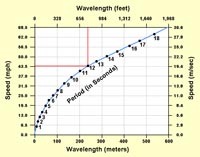 Comparison of wavelength to wave speed and wave period. Wave base is the depth of influence of a passing water wave—it is about half the wavelength of passing water waves (Figure 10-16). At depths greater than half the wavelength wave motion dies out—the water motion is less than 4% of its value at the water surface and is generally insignificant. Passing waves create a circular current in the water. This is revealed by the orbit-like motion of particles in the water. The orbital motion of a wave is greatest at the surface and diminishes with depth. Orbital depth is the depth to which the orbital motion of the wave energy can be felt. Orbital depth is equal to half of the wavelength. At the sea surface, orbital diameter is equal to wave height. As depth increases, less wave energy can be felt. The orbital depth is the depth where zero wave energy remains. For example, if a wave at the surface has a height of 4 meters and a wavelength of 48 m, then the depth where no motion from the wave exists is 48/2 or 24 meters. The depth of the water determines the character of wave behaviors. • Deep-water waves are waves passing through water greater than half of its wavelength. Deep-water waves are waves of oscillation. A wave of oscillation is a wave in the open ocean where movement in the water below a passing wave is in a vertical circular motion. • Shallow-water waves are waves that are interacting with the seabed in depths less than half it wavelength. Shallow-water waves are called waves of transition because they change character as the move shoreward and dissipate their energy interacting with the seabed onto the shore. • As a wave approaches shallow water its begins to transform when it's orbital depth comes in contact with the seabed (when d < L/2). 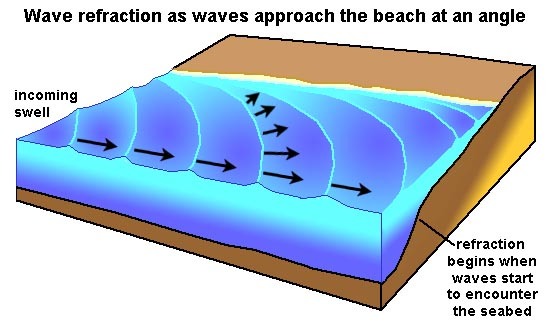 • The friction caused by waves interacting with the seabed causes waves to slow down as the move onshore. • The friction of the seabed begins to slow the bottom of the wave; whereas the top of the wave does not slow as quickly..
• Circular motion within the wave becomes interrupted and becomes elliptical. • As waves approach the beach, their wavelengths (L) and velocity decrease. However the period (T) stays the same. The shortening of the wavelength results in an increase in wave height as it moves into shallow water. • A wave breaks when the water depth (d) is about the same as the wave height (h). Where a wave curls over on itself is called a breaker. • Breakers then turn into a turbulent front called surf that moves onto the beach. • When the dying wave runs up on the beach and then retreats it is called swash. Fig. 10-6. Orbital oscillations in deep and shallow waves. Fig. 10-7. Waves of oscillation, breakers, and waves of transition moving onto the beach. Fig. 10-8. Waves of transition build up, break, and become surf before ending on the beach as swash. When a wave approaches shore, the base of the wave encounters the bottom—the front of the wave slows down and the back overtakes the front. This forces the water into a peak where the top (crest) curves forward. This peak will eventually fall forward in a tumbling rush of foam and water called a breaker. 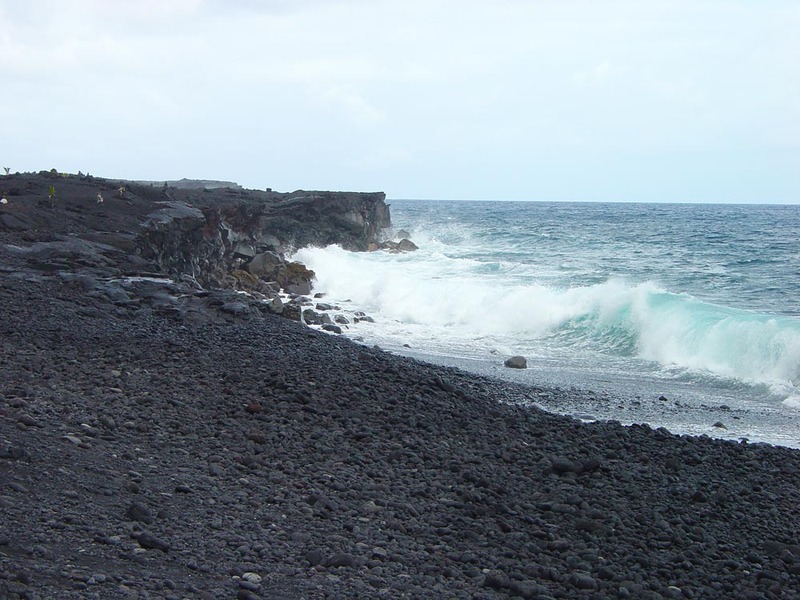 Waves break on or near shore, they also crash over reefs or offshore sandbars if water depths are shallow. 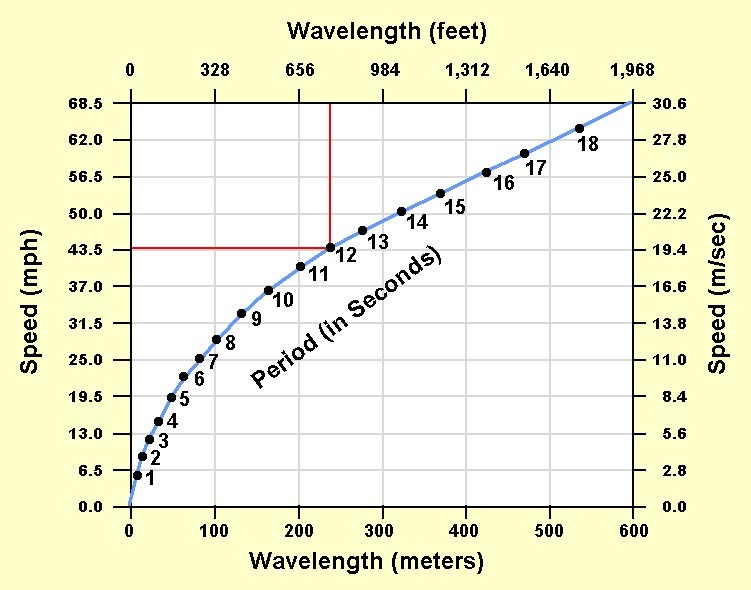 Wave steepness is the ratio of height to wavelength. When wave steepness exceeds a ratio of 1:7, breakers form. Example: If a moving wave has a height of one foot and a length from crest to crest of 8 feet, then the ratio is 1:8 and this wave is not going to break. However, if the height is 1 foot and the length decreases to 6 feet, then the ratio is 1:6, then the wave has now become steep enough that the crest topples over and the wave breaks. 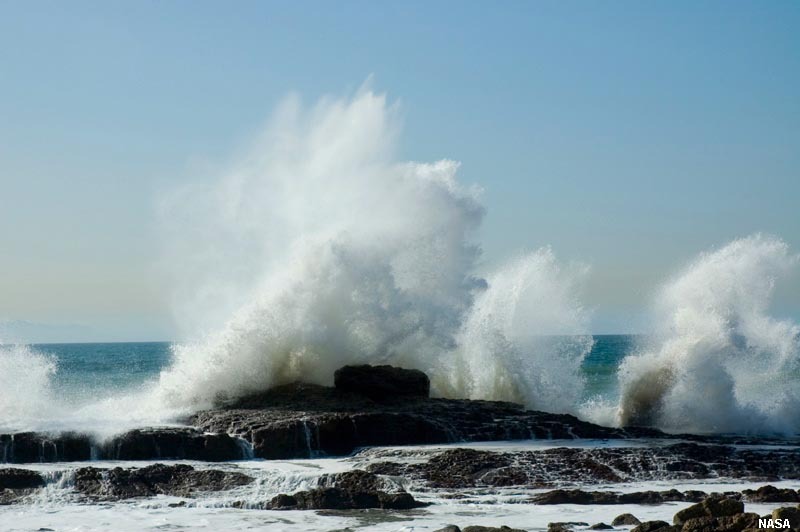 There are three types of breaking waves: spilling breakers, plunging breakers, and surging breakers. Breakers may be one or a combination of these types. Gentle slopes produce spilling breakers. Spilling breakers begin far from shore and take a relatively longer time to reach the beach. The breaking crest slides down the front of the wave in a flurry of foam as the wave moves shoreward. Spilling breakers give surfers a long slow ride. Moderate slopes produce plunging breakers. Plunging breakers build up rapidly into a steeply leaning crest. The crest curls further forward of the rest of the wave before crashing down in the surf zone. Plunging breakers are dangerous because the crash into shallow water. 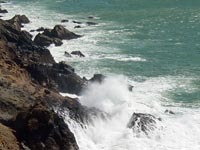 Steep slopes produce surging breakers. Surging breakers occur where waves slam directly on the shoreline. 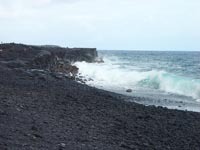 With no gentle slope the waves surge onto a steep beach, producing no tumbling surf. 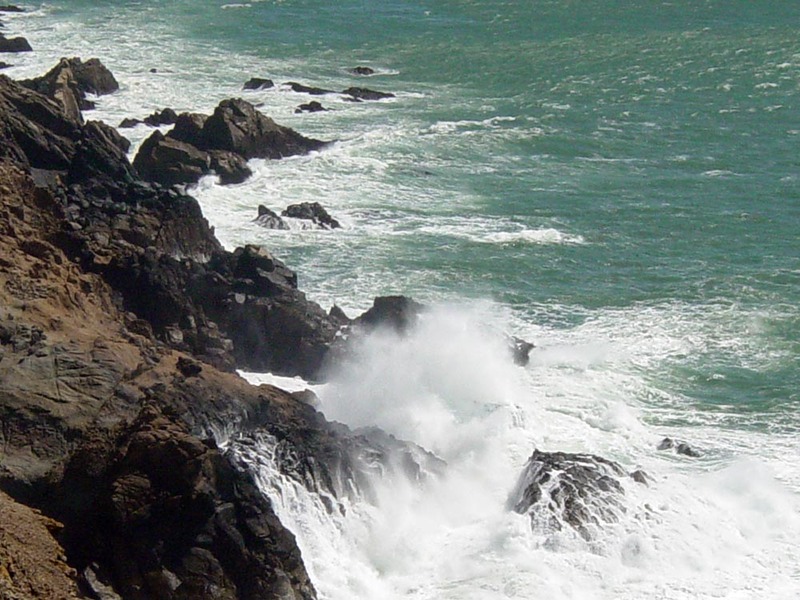 Surging breakers also create huge splashes on a rocky cliff shoreline. 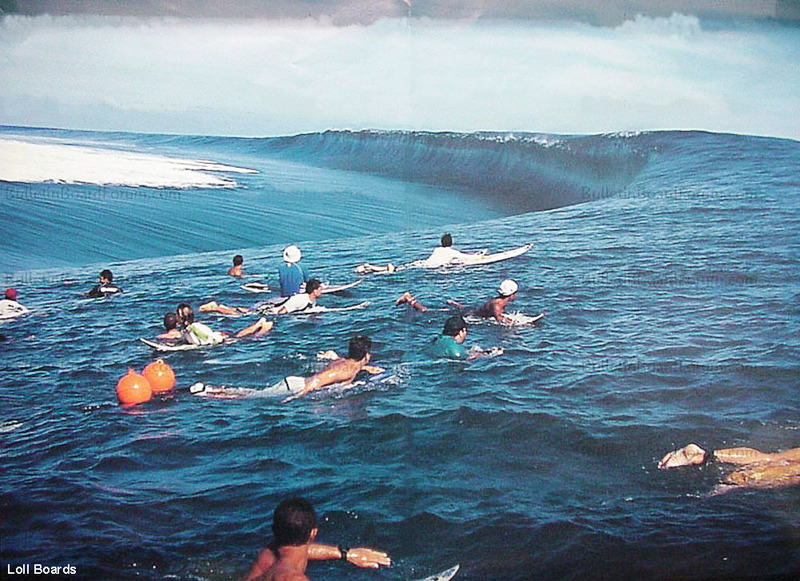 A wave train is a group of waves of equal or similar wavelengths traveling in the same direction. 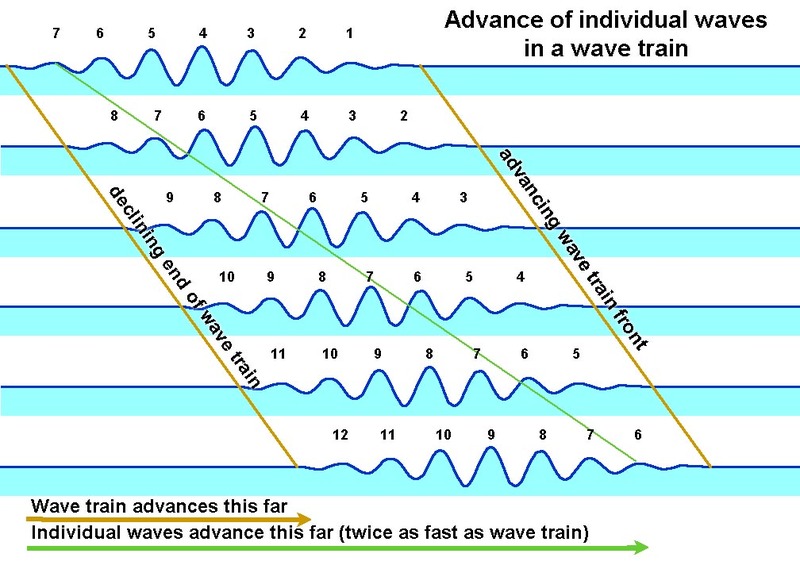 Individual waves move from the back to the front of a wave train, gradually building up, peaking, then declining as it moves to the front of the wave train (Figure 10-14). The result is that individual waves within a wave train are moving about twice as the wave train itself. Surfers watching advancing waves may notice that the first waves to arrive decline in intensity as they arrive as the following waves build higher. After the highest crest passes, the trailing waves decline in intensity as the wave train passes. Fig. 10-14. Waves moving through a wave train. Wind waves form from wind blowing on the ocean surface. The key factors influencing wave intensity include fetch, wind duration, wind strength, and proximity to wind source area. Wind energy is gradually transferred to the waves forming on a body of water, causing waves to absorb energy and grow in amplitude and period over distance and time (Figure 10-15). The transfer of wind energy to wave energy is not very efficient (only about 2% of the energy is actually transferred) but it is the size of the area that the wind is impacting, as well as how strong the wind is blowing that matters. • Fetch is the length (distance) wind blows over open water. This is the uninterrupted distance over which the wind blows without significant change in direction. • Duration is how long the wind blows. Strong wind that does not blow for a long period will not generate large waves. • Wind strength: The stronger the wind, the bigger the waves. The wind must be moving faster than the wave crests for energy to be transferred. 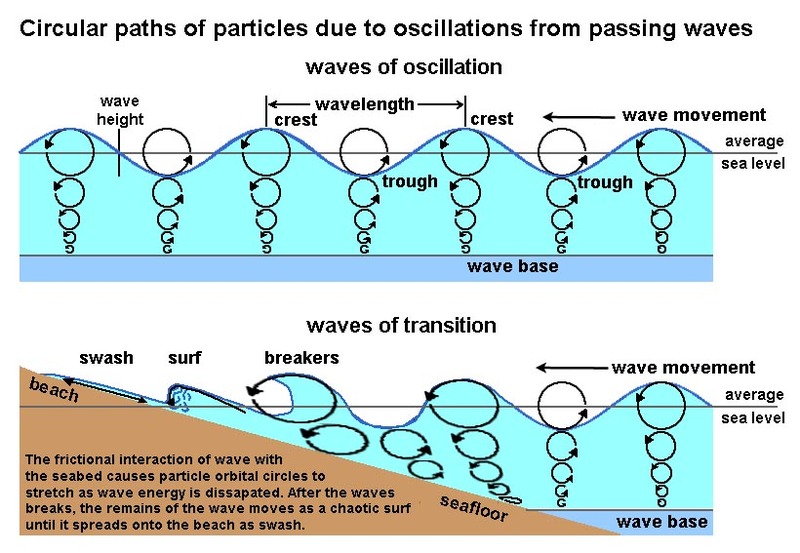 • Proximity: Separation of wave trains by period. Long-period waves move faster than shorter-period waves and will separate and advance before wave trains with shorter periods. • Direction - wave travel in the direction that the wind blows. 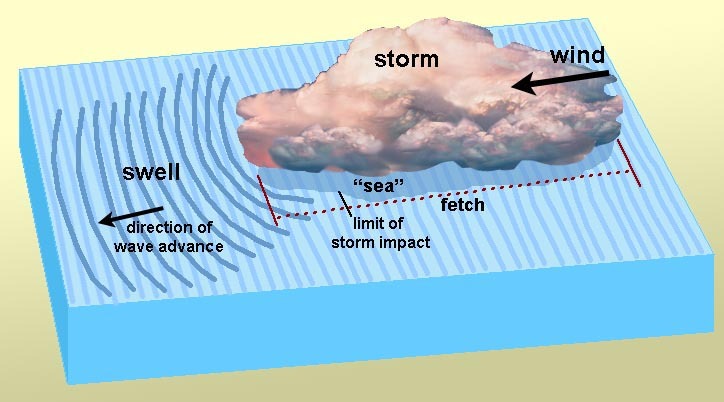 Fetch is important because the interrelationship between wind speed and duration, both functions of fetch, is predictive of wave conditions. Fig. 10-15. 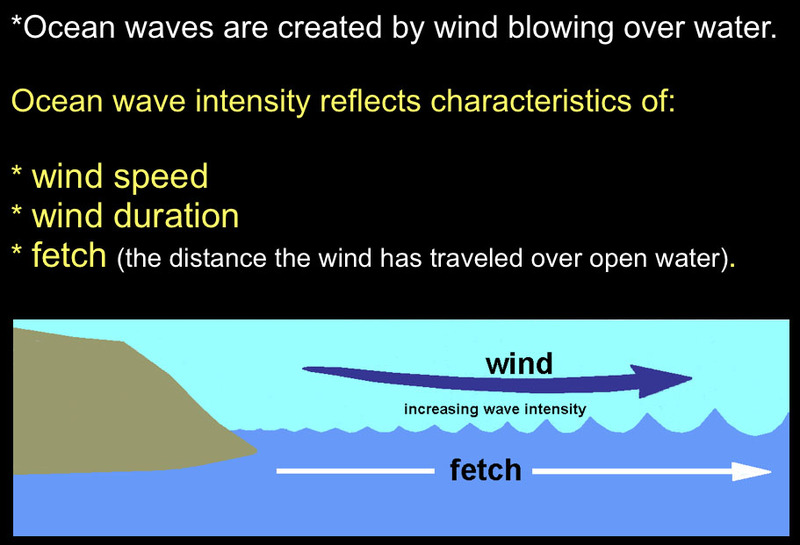 Waves energy depends on wind speed, wind duration, and fetch. Figure 10-16. Sea and Swells illustrated. A storm generates winds that impact a region over open water. The area impacted by the wind is called a sea. The waves generated by the storm will move out and away from sea are called swell. • Sea: Area where wind waves are generated, mixed period and wavelengths. Seas are typically a chaotic jumble of waves of many different sizes (wave heights, wavelengths, and periods) (Figure 10-16). • Fully Developed Sea: Max size waves can grow given a certain fetch, wind speed and duration. Ocean swell refers to series of ocean surface waves that were not generated by the local wind. Swell refers to an increase in wave height due to a distant storm. Ocean swell waves often have a long wavelength. 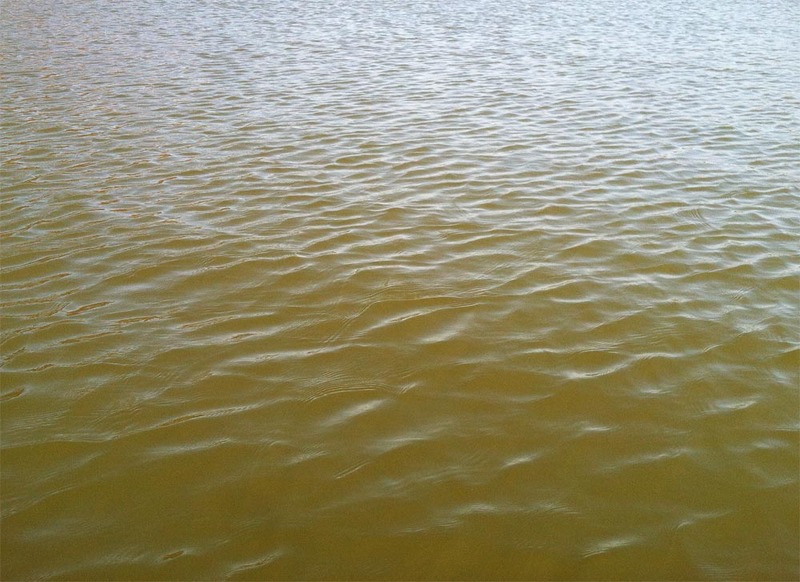 Swell can develop on lakes and bays, but their size varies with the size of the water body and wave intensity. As waves move out and away from the storm center, they sort themselves out into groups of similar speeds and wavelengths. This produces the smooth undulating ocean surface called a swell. Swells may travel thousands of kilometers from the storm center until they strike shore. 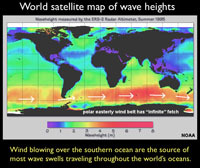 Swells are generated by storms over the open ocean, but many ocean swells originate in the oceans around Antarctica where there is high winds with nearly infinite duration and fetch (Figure 10-17). Fig. 10-17. Most ocean swells originate in the southern oceans where strong winds combine with unlimited fetch. 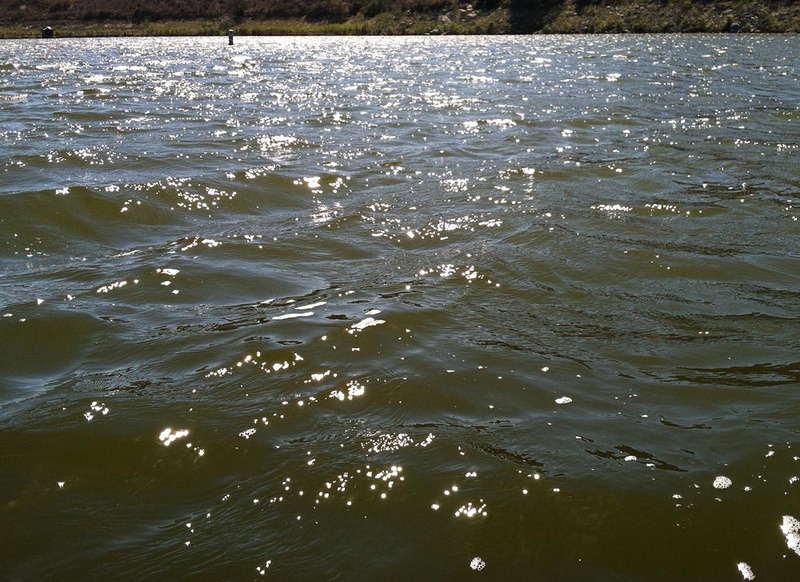 When the wind starts to blow, the surface of a water body will go through a progression as waves form and intensify. When the wind starts to blow, the ocean surface will change from calm (mirror-like) conditions to form capillary waves (ripples), chop, wavelets, to waves (each with increasing wavelengths, wave heights, and wave periods). Smaller wave features can form on existing larger wave features, adding to the complexity of the water's surface. Capillary waves are very small waves with wavelengths less than 1.7 cm or 0.68 inches (Figure 10-18). The formation of capillary waves is influenced by both the effects of surface tension and gravity. The ruffling of the water’s surface due to pressure variations of the wind on the water. This creates stress on the water and results in tiny short wavelength waves called ripples. Ripples are often called capillary waves. 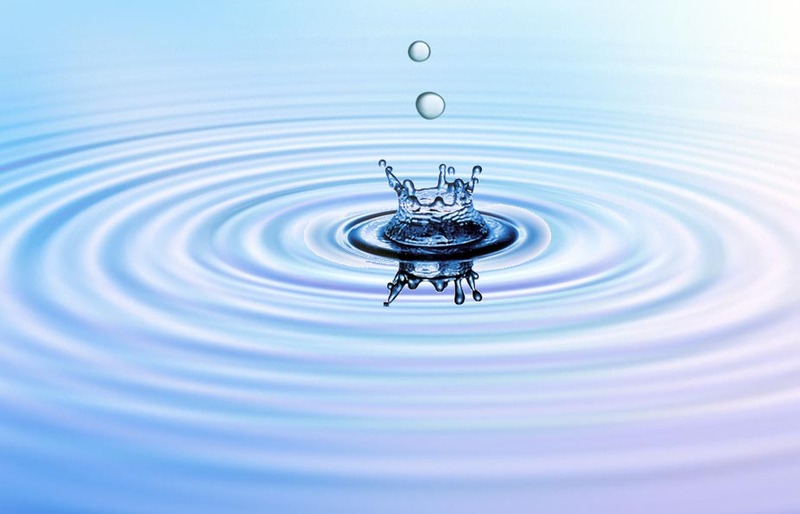 The motion of a ripple is governed by surface tension.They are the first waves to form when the wind blows over the surface of the water and are created by the friction of wind and the surface tension of the water. These tiny little waves increase the surface area of the sea surface and if the wind continues to blow, the size of the wave will increase in size and become a wind wave. 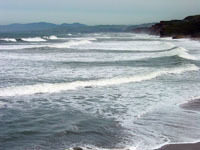 Chop refers to small waves causing the ocean surface to be rough. Ripples and small wavelets form and move independently of large waves moving through an area, creating rough and irregular wave patterns (Figure 10-19). Fig. 10-19. 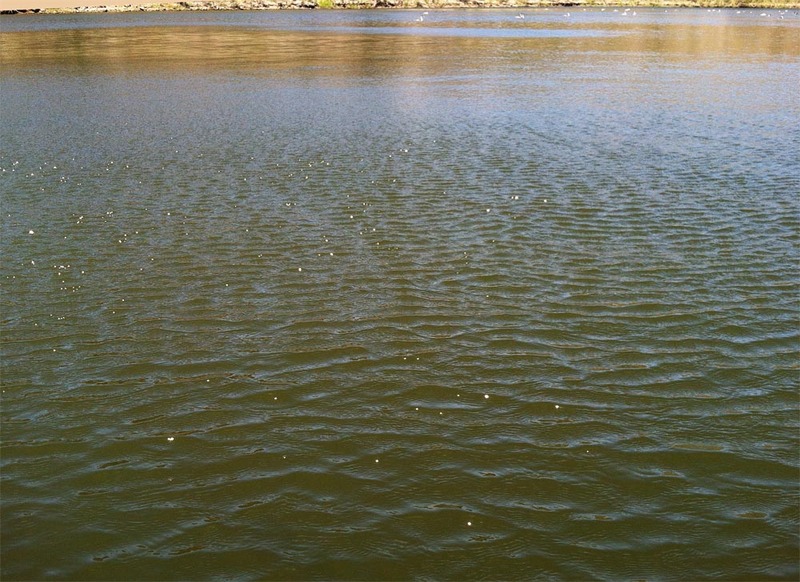 With increasing fetch, ripples merge to become wavelets in choppy surface water conditions. A cat's paw is the imprint that a light breeze that ruffles small areas of a water surface. When generated by light wind in open water, a nautical name for them is cat's paw waves, since they may resemble paw prints (Figure 10-20). Light breezes which stir up such small ripples are also sometimes referred to as cat's paws. On the open ocean, much larger ocean surface waves (seas and swells) may result from coalescence of smaller wind-caused ripple-waves. A squall is a sudden violent gust of wind or a localized storm. A squall line is a line of thunderstorms that can form along or ahead of a cold front. It contains heavy precipitation, hail, frequent lightning, strong straight-line winds, and possibly tornadoes and waterspouts. At sea, a squall is used to describe a relatively rapid change in weather from calm or mild weather to sudden strong winds and intense precipitation, usually associated with passing a cold front. Fig. 10-20. 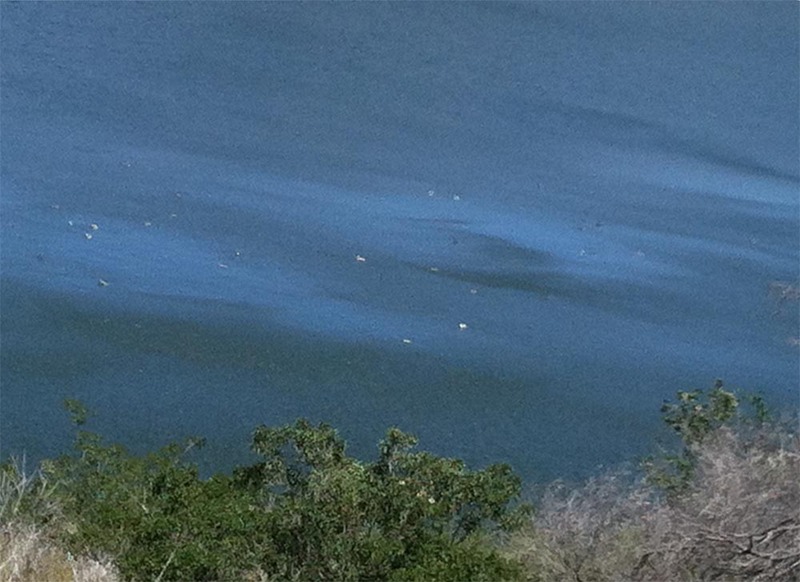 Wind gusts creating cat paws capillary ripple patterns on the lake surface. 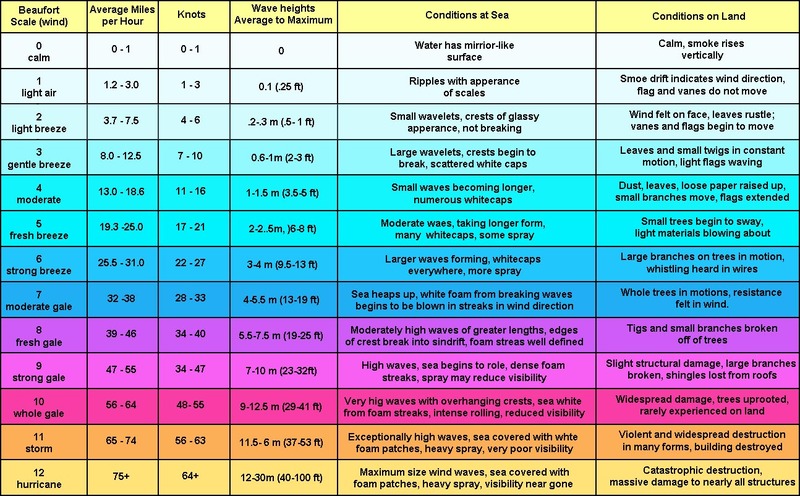 The Beaufort wind force scale relates wind speed (velocity) to observed conditions at sea (including wave height) or impact of features on land. It is a numbered scale from 0 to 12 to describe sea conditions and wave size. The Beaufort Scale was developed by Rear Admiral Sir Francis Beaufort 1774-1857, an officer in Britain's Royal Navy). Zero 0 on the Beaufort scale represents the calmest of seas (the water is so smooth that it looks like glass). A 12 on the Beaufort scale represents hurricane force waves (Figure 10-21). Figure 10-21. Beaufort Wind Force Scale for sea conditions (and on land). 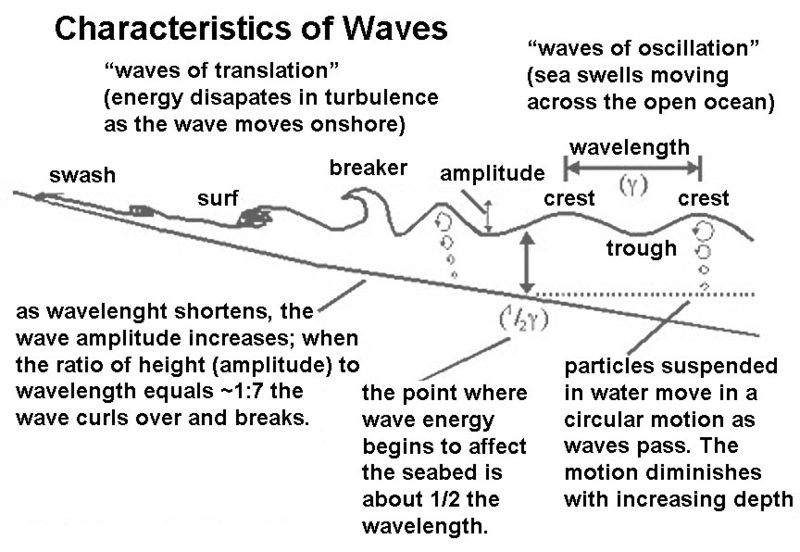 Wave interference occurs where waves from different sources collide (Figures 10-22 and 10-23). Constructive wave interference occurs where waves come together in phase or crest meets another crest (or trough meets another trough) . • Destructive wave interference: Waves come together out of phase or crest meets a trough. Fig. 10-22. 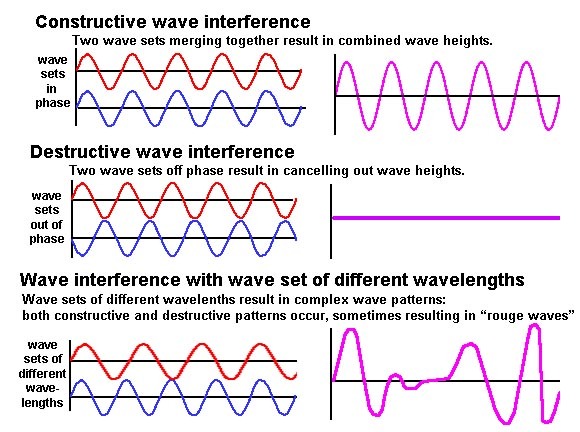 Examples of constructive and destructive wave interference patterns. Fig. 10-23. Interference patterns created by winds gusts blowing from different directions. Rogue waves are large, unpredictable, and dangerous. Rogue waves (also called 'extreme storm waves') are those waves which are greater than twice the size of surrounding waves. They often come unexpectedly from directions other than prevailing wind and waves. Many reports of extreme storm waves describe them sudden "walls of water." They are often steep-sided and associated with unusually deep troughs. Some rogue waves are a result of constructive interference of swells traveling at different speeds and directions. As these swells pass through one another, their crests, troughs, and wavelengths sometimes coincide and reinforce each other. This process produces large, towering waves that quickly form and disappear. If the swells are traveling roughly in the same direction, these massive waves may last for several minutes before subsiding. Rogue waves can also form when storm swells move against a strong current, resulting in a shortening of the wavelength and increasing it’s amplitude. Large rouge wave of this kind are frequently experienced in the Gulf Stream and Agulhas currents (Figure 10-24). Fig. 10-24. This 60 foot rouge wave threatened a ship in the Gulf Stream near Charleston, South Carolina. Rogue wave have sunk ships, destroyed drilling rigs, and are responsible for many deaths and injuries along coastlines. Waves can bend when they encounter obstacles or changes on the sea floor. • Refraction involves bending. 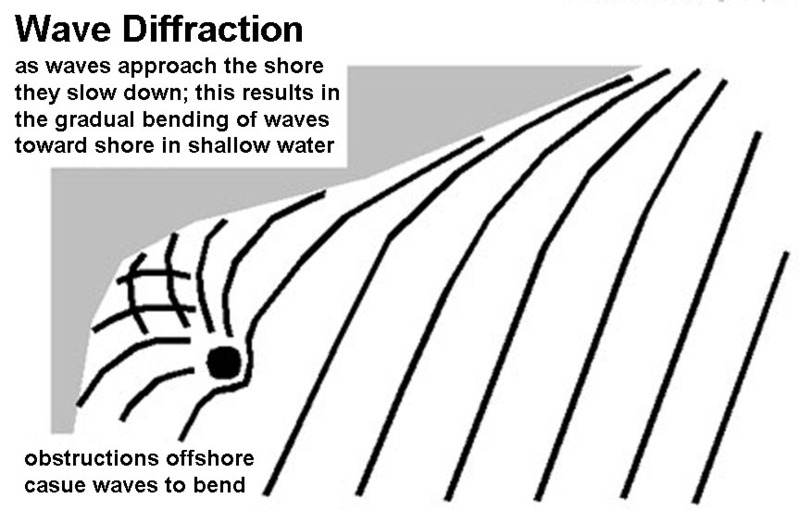 Wave refraction starts when wave base starts to interact with the sea bed and slow the waves down, causing them to bend toward shore. Refraction occurs when wave swells approach the beach at an angle (Figure 10-25). • Diffraction involves spreading (or dispersion) of wave energy. Wave diffraction refers to various phenomena which occur when a wave encounters an obstacle or change in geometry of the seabed. For example waves are diffracted when they when they pass an island, or when they pass a point or other structure, such as a jetty at the mouth of a harbor (Figure 10-26). • Reflection (bouncing) involves crashing into a solid surface (such as a seawall or cliff) and reflecting back to sea. Reflection can result in standing waves—waves that move back and forth (oscillate) in a vertical position waves strike an obstruction head-on and then are reflected backwards in the direction they came from. Fig. 10-25. Wave refraction as waves approach the beach at an angle. • The compass bearing window that we can receive swell from is between 180° and 340° (Figure 10-27). Waves are weak on the “edges” of this window. The best part of our window is really between 200° and 300° degrees because the waves simply have to bend too much to be received on our coastline if they are outside of that range. • Everyone loves a West Swell! Fig. 10-27. 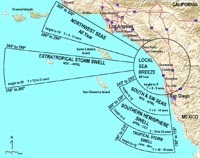 The swell window for San Diego County is roughly between 180° and 340° (with North being 360°). 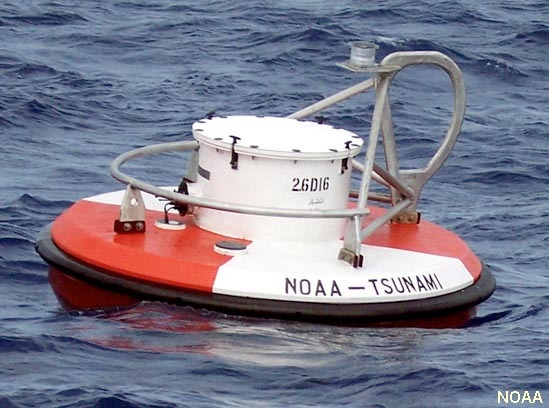 professional surfers (and swell wave forecasters for navigation and other purposes) use real-time buoy information available from the National Data Buoy Center (NOAA) network to evaluate swell period and height in different parts of the Pacific Ocean basin and around the world. 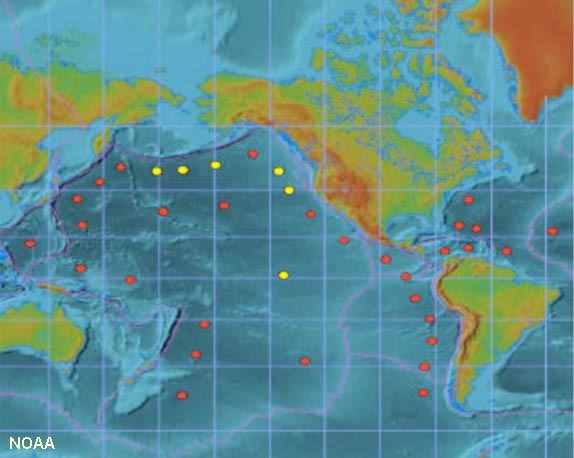 Data from this system is incorporated into many government weather and commercial shipping navigation websites and several surfing organization websites. 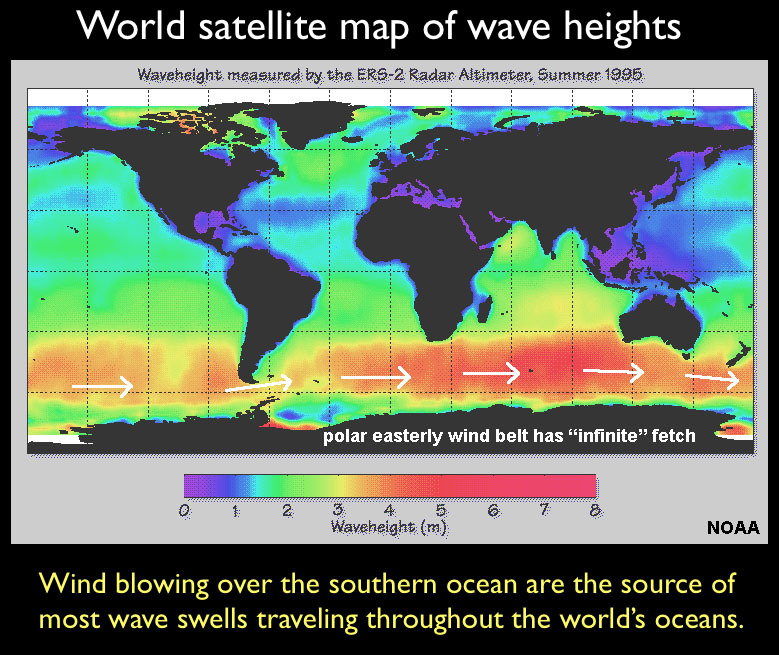 • Swell generated between Antarctica and New Zealand dominates the world oceans much of the year because it is a region with large storms (largest on Earth), and there is constant wind (infinite duration) and unhindered passage over open waters (infinite fetch)(Figure 10-29). • In the northern Pacific Ocean, storm track is always west to east. • Initial angle is 210 degrees (west-southwest), then moves towards 180 degrees (south) and out of our swell window. 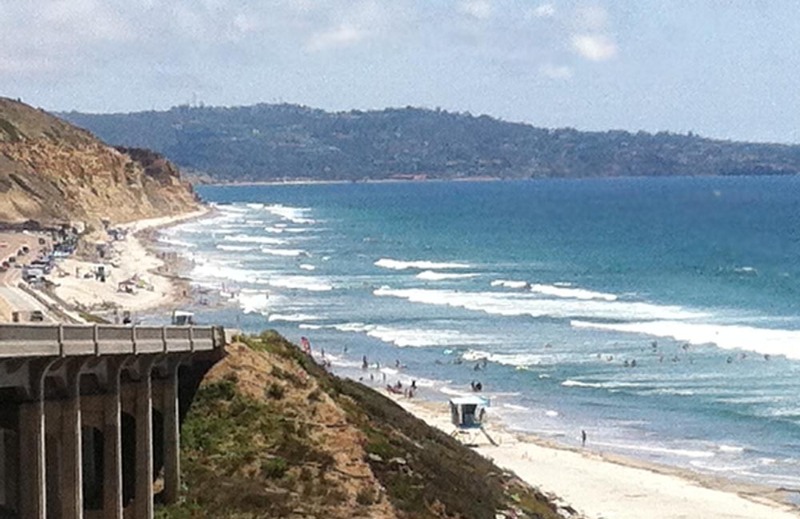 • The largest summer surf is in northern San Diego County comes from the south. • Early season swell is usually more northerly (N or NNW direction or about 320 to 340 degrees). • Later season storms drop farther south and give us a more westerly swell direction from about 280 to 300 degrees. We also get more rain from these storms. 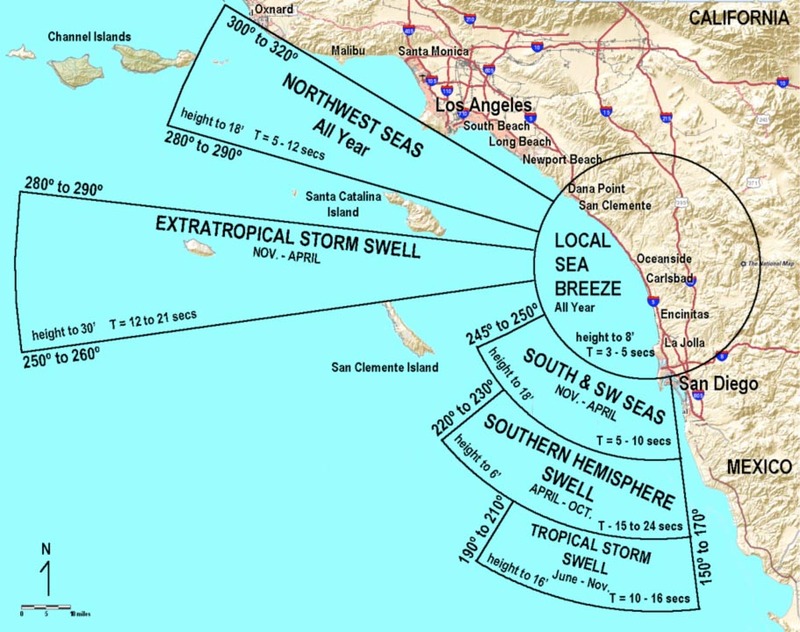 • Partial swell blockage occurs in the Southern California Bight from wave shadows created from the Channel Islands. 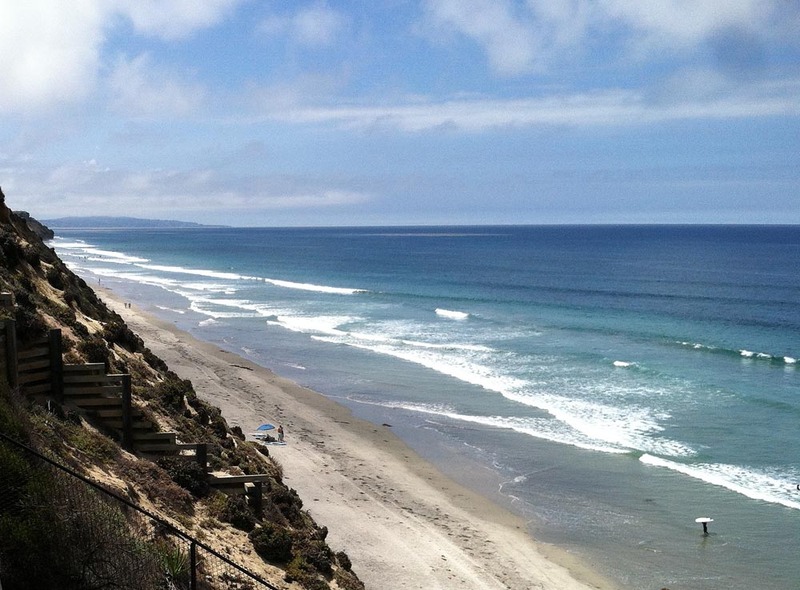 • During the winter the largest surf is in southern San Diego County and northern Baja. We also can get colder water and upwelling conditions. 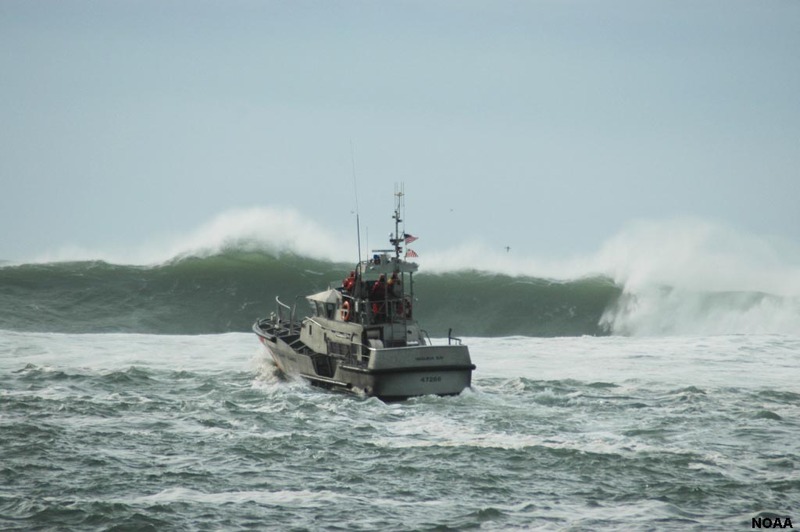 We have a number of locally generated swells that come from smaller storms in the Pacific Northwest. • These storms produce surf that has a shorter period (between 6 and 10 seconds) because the storms are not very large. • The swell angle is very steep from the north-northwest around 320 to 340 degrees. • We often get upwelling associated with these storms as well. During the late summer and early fall we can get swell from hurricanes that form off of the coast of mainland Mexico. • The wave periods generated from these storms is usually between 10 and 14 seconds. • The key identifying waves from these storms is the angle. The swell angle begins from the S or SSE between 160 and 180 degrees. The angle increases with time as the storm moves up the coast and either onshore or out to sea towards Hawaii. Fig. 10-29. 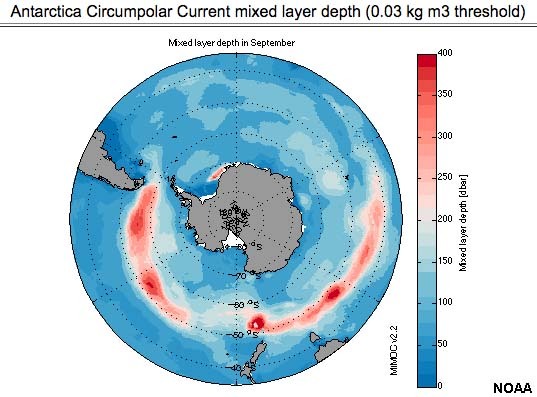 The Antarctic Circumpolar wind belt is the source of most swells. Why? Fig. 10-30. A southwest swell coming in at Beacons Beach, Encinitas, San Diego County, California. 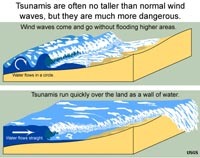 A tsunami is a very long and/or high sea wave or coastal serge of water caused by an earthquake or other disturbance. 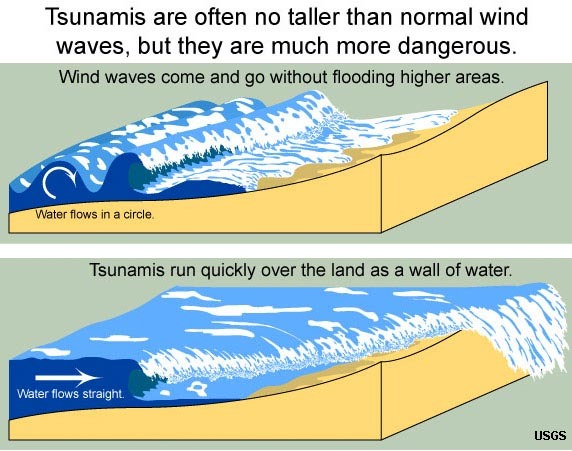 Tsunamis get their name from Japan (where they are fairly common): "Tsu"[ harbor], "nami" [wave]. Tsunamis are caused by displacement of the earth's crust under an ocean or body of water of any size. They can also be generated by earthquakes, volcanic explosions, underwater landslides, even asteroid impacts. When the solid earth moves, the water above it also moves with it (Figures 10-32 and 10-33). Tsunamis are the result of both the initial shock waves and the following motion of the water readjusting to a stable pool (sea level). Tsunamis can travel great distances throughout the world's ocean. Their energy is dissipated when they approach shorelines where they come onshore as a great surge of water, with or withoutmassive waves crashing onshore. 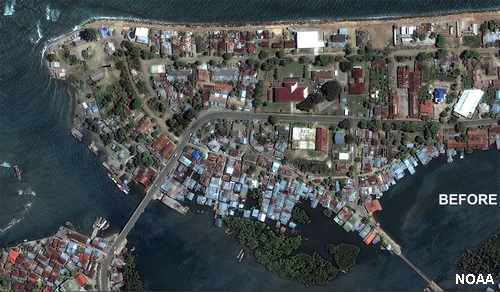 Although most tsunamis are small (barely detectible), some modern tsunamis have reached inland elevations many hundreds of feet above sea level. • Tsunamis are usually less than 2 feet in the open ocean. • In deep ocean, tsunami wavelengths are long, commonly 100’s of miles. • Tsunamis always behave like shallow water waves ( d < L/20) because no ocean deep enough! • Undetectable by ships in open ocean because wavelengths are so long (slow rise and fall as wave passes). • Open ocean tsunami velocity is 400 – 500 mph. So about 4 – 5 hours from Alaska to San Diego (or Hawaii). • Wave stacks up on continental shelf, about ½ of the time a trough arrives first (sea recedes from shore). • Waves 30 – 100 ft are common – locally run-up can be higher. • Highest is thought to be +300 ft., 66 million years ago from asteroid collision in the Gulf of Mexico. Fig. 10-32. 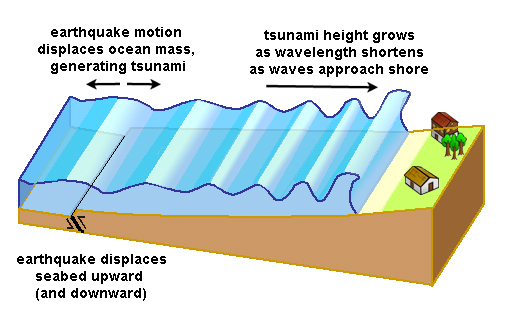 How a tsunami is generated by an earthquake. Fig. 10-33. Tsunamis move onshore more as a surge than just a wave. 26 December 2004 The 9.1 magnitude earthquake offshore of Sumatra. The fault zone that caused the tsunami was roughly 800 miles (1300 km) long, vertically displacing the sea floor by several meters. 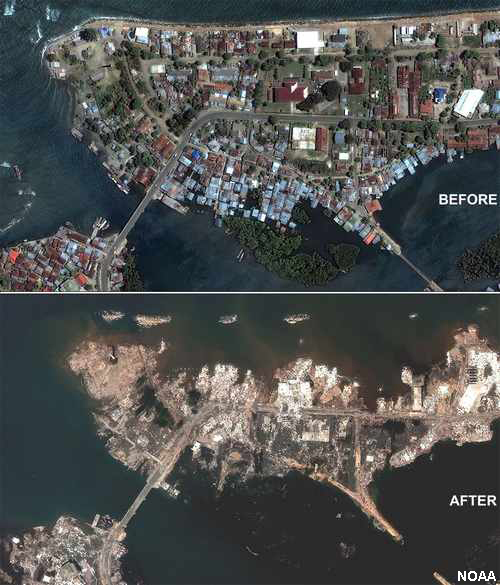 Tsunami was as tall as 50 m, reaching about 3 miles (5 km) inland. Many billions in damage, estimated 230,000 people killed. 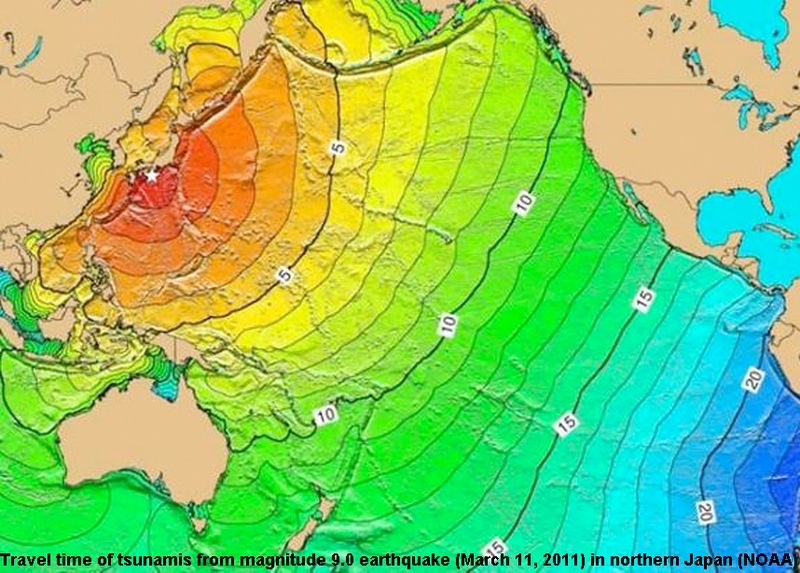 11 March 2011 Tsunami was spawned by an 9.0 magnitude earthquake. 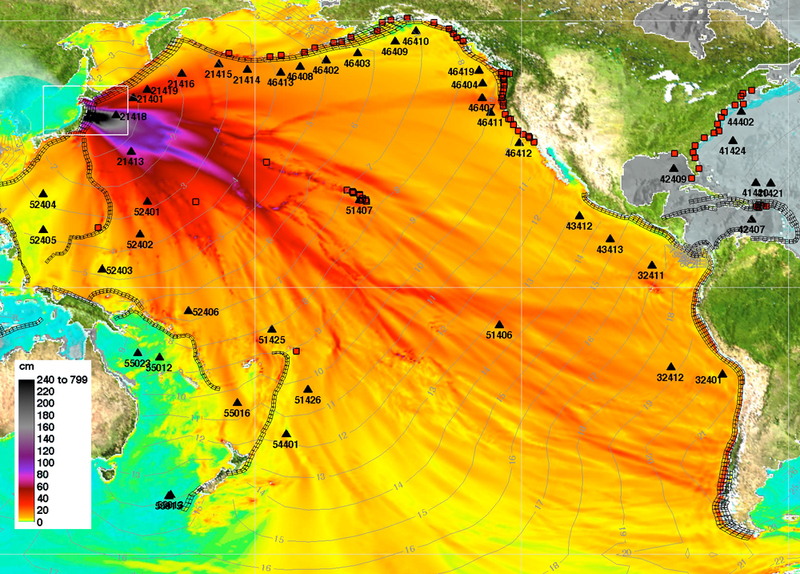 Many coastal communities were destroyed and the Fukushima Daiichi nuclear power plant was damaged, releasing radiation 10 m-high waves swept over the east coast of Japan, killing more than 18,000 people, Most expensive disaster in history: ~$235 billion. 1 November 1755 A magnitude 8.5 earthquake produced a series of three huge waves that struck various towns along the west coast of Portugal and Spain. Tsunami was up to 30 m high in some places The earthquake and tsunami killed an estimated 60,000 people in the Portugal, Spain, and Morocco. 27 August 1883 This tsunami event was caused by explosive eruptions of the Krakatoa caldera volcano in the Sunda Strait between the islands of Java and Sumatra. Multiple waves as high as 37 m. The event killed about 40,000 people in total; however, about 2,000 deaths were from the volcanic eruptions. Enshunada Sea, Japan, 20 September 1498 An earthquake estimated about magnitude 8.3, caused tsunami waves along the coasts of Izu, Kii, Mikawa, Sagami, and Surugu (Japan). 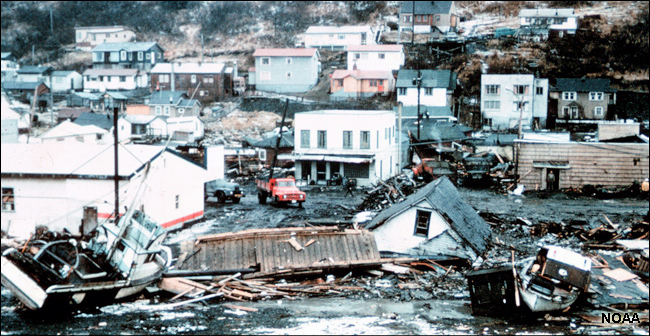 Coastal communities were washed away; estimated 31,000 people were killed. 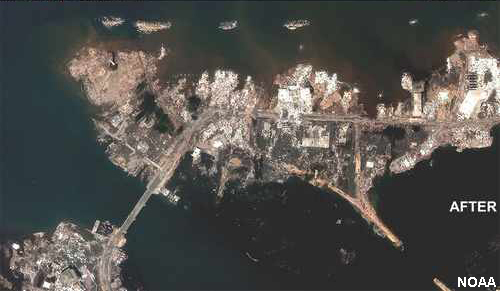 28 October 1707 A magnitude 8.4 earthquake caused tsunamis as high as 25 m that swept onto the Pacific coasts of Kyushyu, Shikoku and Honshin. About 30,000 buildings were damaged and about 30,000 people were killed. 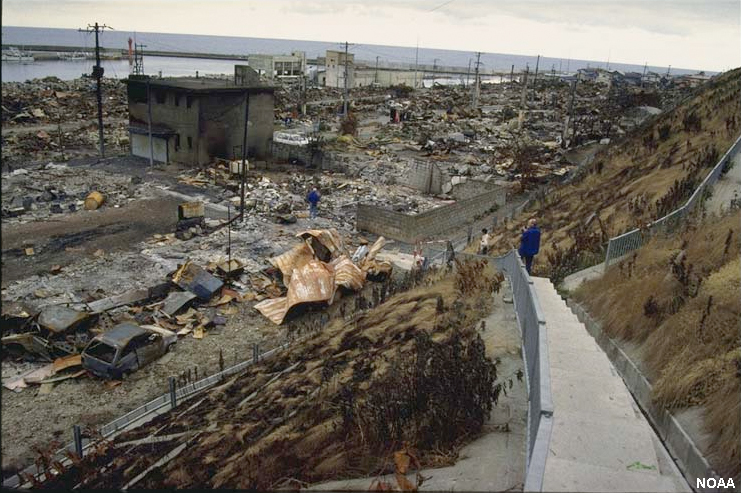 An estimated magnitude 7.6 earthquake off the coast of Sanriku, Japan generated a tsunami reported to have reached a height of 38.2 m. 11,000 homes destroyed and 22,000 people killed in Japan; 4,000 also killed in China. 13 August 1868 Earthquakes estimated at magnitude 8.5, off the coast of Africa, Peru (now Chile). Tsunamis affected entire Pacific Rim; waves reported up to 21 m high over two and three days. Estimated 25,000 deaths and an $300 million in damages caused by the tsunamis and earthquakes along Peru-Chile coasts. 24 April 1771 A magnitude 7.4 earthquake produced a tsunami that damaged coastal communities on Ishigaki and Miyako Islands and others in the region. 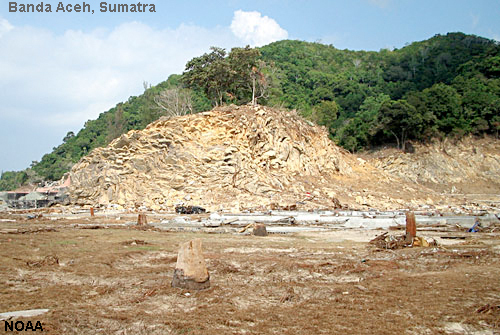 Tsunamis were 11 to 15 m high. 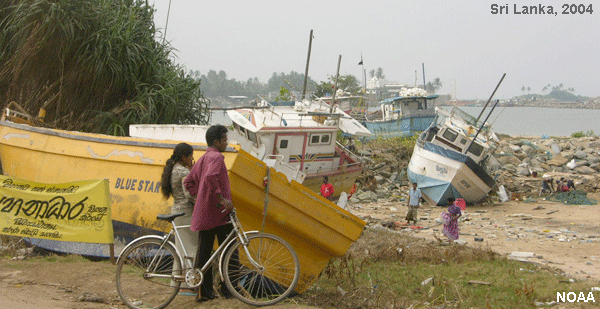 Tsunami destroyed 3,137 homes and about12,000 people were killed. 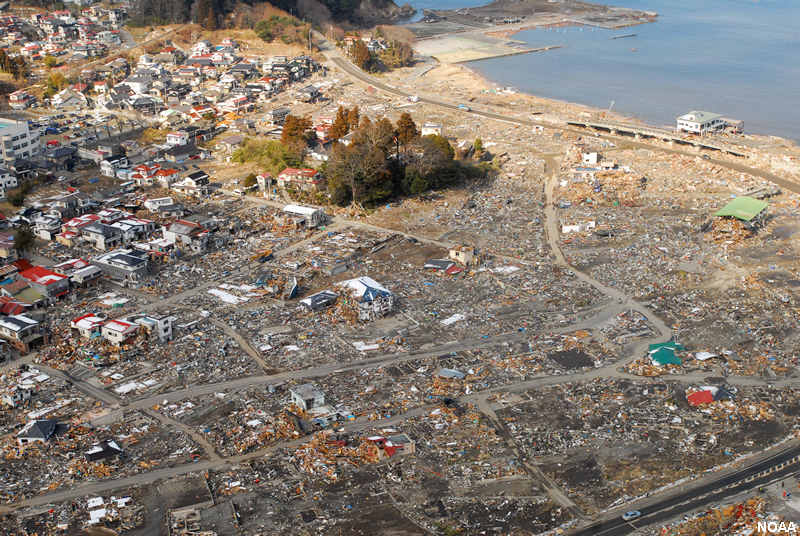 18 January 1586 An earthquake that caused a tsunami estimated to be about magnitude 8.2. 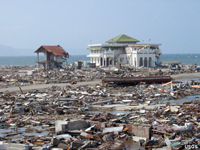 The tsunamis rose to a height of 6 m. Earthquake and following fired destroyed most of a city. 8000 people were killed. Simple tsunami origin animation (NOAA) - How tsunamis form from an earthquake. Three Chile Tsunamis animation (PTWC) - Breakout animations of tsunamis of different intensities. Fig. 10-34. 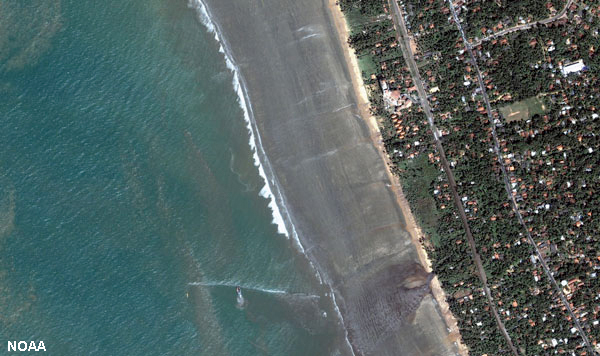 Drawback from tsunami in Sri Lanka exposed about 150 meters before the tsunamis arrived from 2004 earthquake. Fig. 10-36. 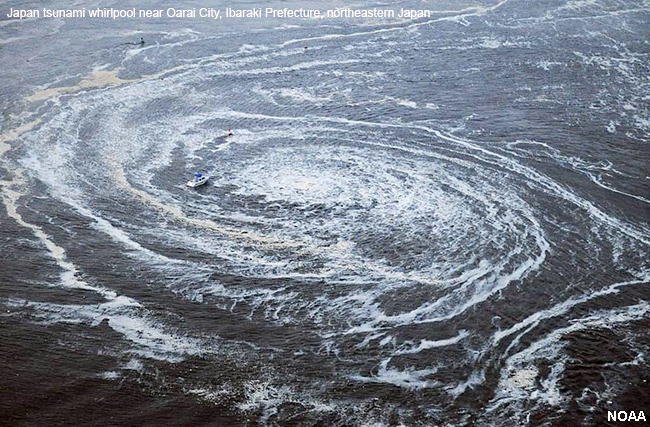 Giant whirlpool caused by the Japan, 2011 tsunamis (note the boat for scale). Pacific Tsunami Warning Center website. Fig. 10-49 & 50. 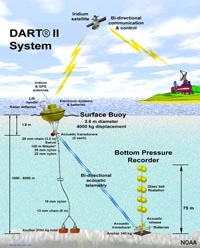 DART Buoy and DART tsunami warning system (left). Fig. 10-51. 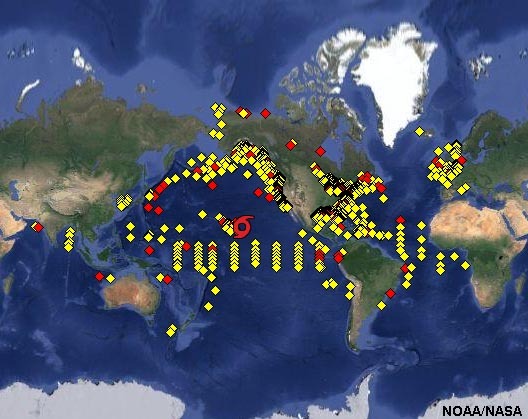 Location of tsunami warning system buoys around Pacific and Atlantic basins.